This is the fourth in a series of five CD reissues from guitar legend Joe Diorio's classic Spitball Records recordings from the 1970's. 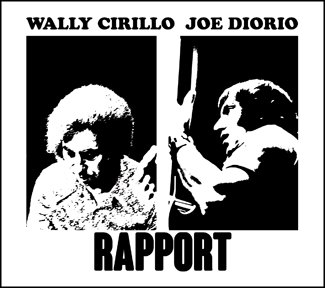 Originally released in 1974 on Spitball Records, "Rapport" was recorded on April 29, 1973 at The First Unitarian Church in Miami, Florida and features Joe Diorio on guitar and Wally Cirillo on piano. Now available for the first time on CD including the original album cover artwork and liner notes from the original LP release. The album contains three original compositions by Joe Diorio and Wally Cirillo, "Talla Sunshine and Naima Rainbow: Dance for Their Father", "Emiereicity" and "Lovely Afternoon", in addition to the song "Sonnymoon for Two / Four Score" by Sonny Rollins and Wally Cirillo. 24-bit digital remastering by Paul G. Kohler at Art of Life Studios in Charleston, South Carolina in January 2019. Art of Life Records is pleased to make this long out-of-print recording available to the world once again. Stay tuned for more Joe Diorio CD reissues from Art of Life Records. This piano/guitar duo cannot be compared to any similar team in the past (such as, let’s say, Bill Evans and Jim Hall). They make music that is very heady and the extensive liner notes bear that contention out. The rapport and talent are impressive and the music is equally impressive, although somewhat advanced. The two men complement each other in a close and intimate way and the free conceptions which break up their music allow for growth, change and open spontaneity as they play... Good, solid, thought-provoking music by two men coming to freedom because it is so natural. No rhythm section, no overdubbed horns - just these two mature, explorational artists exchanging emotions, ideas, leads, tonal colors and inspiration. Fortunately (not always the case in such music) both performers know their instruments as well as their music. “Rapport” is a fascinating and highly successful pioneering effort into the realm of contemporary abstract improvisation. If dedicated collective improvisation is your cup of tea and the absence of anything resembling swing doesn’t bother you, you may find this a delightful record. Guitarists and guitar lovers will want to check it out regardless since a Diorio recording unfortunately is a rare event and since Diorio unquestionably is a major talent... This is a worthy debut for a new independent label.